I begin this weekend without any major shooting events. Considering I’m living in a country that was on the losing end of this American holiday, there aren’t many celebrations to be had. However, I received many emails on shooting 4thof July fireworks celebrations. Therefore, I wanted to provide my input. 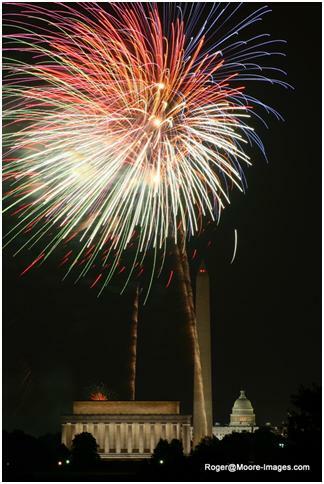 Historically, the camera settings were the “trickiest” part of photographing fireworks. However, many newer models come with an actual “Fireworks” setting. Therefore, much of the mystery is removed. Great fireworks images contain more than the brilliant and colorful bursts in the night sky. They provide a beautiful skyline composition or other landmarks that provide a sense of place to the image. However, before we begin with the composition, some basic gear is necessary. Any sharp fireworks image requires a tripod. You can obtain an inexpensive one, under $30 dollars from local electronic or retail stores. They provide stability and provide sharp images difficult to obtain otherwise. Next, use a remote trigger. This allows the user to activate the shutter without touching the camera. Even the slight vibration from pressing the camera button creates enough shake to blur the images slightly. If that is not available, put the camera on a two-second delay if possible. That requires great timing considering you must anticipate when the bursts will appear. Secondly, compose the shot to include buildings or a familiar image. These elements disclose your location and show how large the displays were. They also help to focus the camera prior to the fireworks. Some cameras do not have a fireworks setting. Therefore, manual exposure settings are necessary. If you have a Point & Shoot (P&S) without a fireworks setting, I recommend you put the camera on the “Shutter Priority” setting (i.e., S or Sv) between three to five seconds. This value depends on the length of the fireworks burst. I typically try to keep the shutter open long enough to get a burst from its lift-off to the burst in the sky. You may have to change this setting during the fireworks. Therefore, understand this setting so you can make the necessary changes quickly. 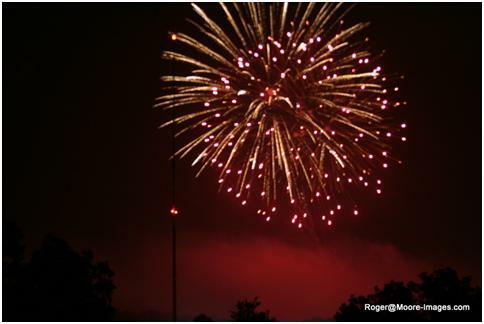 Taking photos of fireworks at night is difficult for the camera’s auto focusing mechanism whether it’s a P&S or SLR. The camera is attempting to photograph a moving object at night that is visible for only a few seconds. Therefore, it is highly recommended that you turn off the Auto focus setting—if possible. This is another reason why landscapes are helpful. They allow you to focus on the building manually. 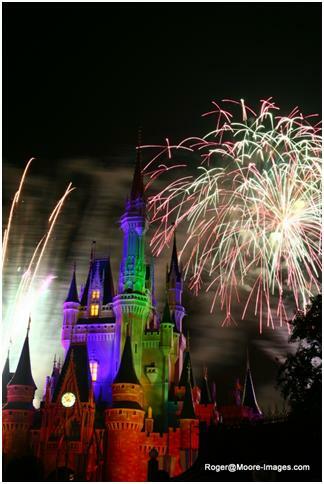 Therefore, when the fireworks begin, the camera is set to sharply capture the images. SLR USERS – I recommend the aperture set to F/8 to F/16. This will allow you to obtain enough depth of focus even if the fireworks are not allows on the same focus plane. Also, set the manual focus to infinity unless you’re very close to the action. P&S users do not typically have to worry about their aperture since the smaller sensor size provides very adequate depth of focus. 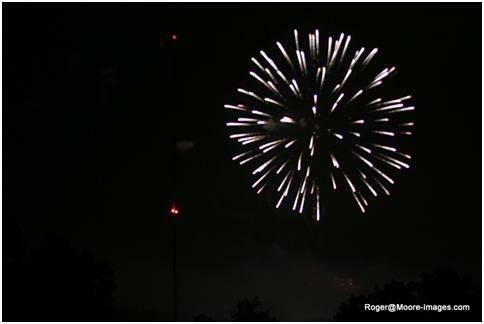 Lastly, I included fireworks shots from my first attempt. They’re only the burst. You do not see the lift-off. Also, there are no recognizable landmarks. They do not provide any scale or sense or location that I discussed earlier. The images lack interest. However, I linked my other images and you can immediately tell where I was and how big the celebration was. 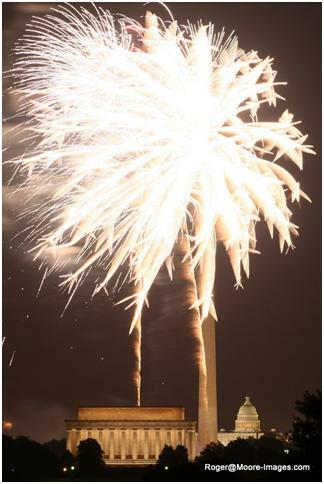 I Included a link to some additional fireworks images. I hope you like them.